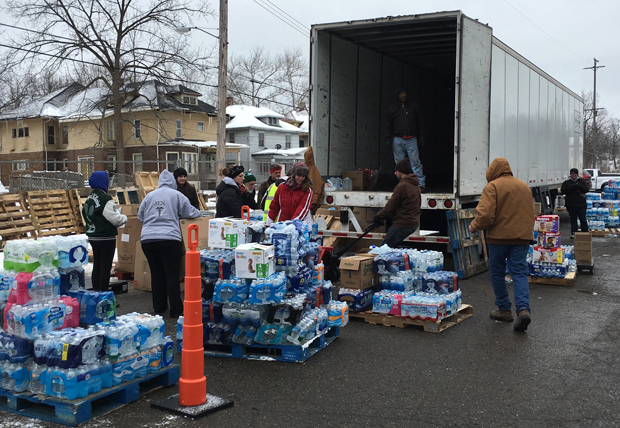 LANSING, Mich. (CNS) — Especially during the Lenten season, everyone should “redouble both their prayers and their generosity” for the people of Flint still struggling with unsafe drinking water through the city’s water crisis, said Lansing Bishop Earl A. Boyea. “It is gratifying to see that Catholic communities in Michigan and beyond have come forward to assist the remarkable efforts of Catholic Charities,” he said in a statement. Catholic Charities of Shiawassee and Genesee Counties, based in the heart of Flint, “is on the front lines of the relief and recovery efforts” in partnership with many other community members, the Lansing Diocese noted in a news release with the bishop’s statement. CNN reported Feb. 28 that newly released emails show that “a year before the seriousness of the crisis became clear,” some top aides to Gov. Rick Snyder urged state officials to switch Flint’s source for drinking water away from the Flint River. In April 2014, when the city was under the control of a state-appointed emergency manager, a decision was made to switch the city’s water source from Detroit’s supply to the Flint River to save money. According to several news accounts, the water from the river contains eight times more chloride than Detroit’s water and that the chemical, which is corrosive to metals, ate away at old lead-lined service pipes that connect to residents’ homes. It allowed lead to enter people’s water supply because officials put no controls in place to prevent that from happening. In March 2015, the Flint City Council voted to do whatever was needed to return to purchasing water from the Detroit Water and Sewerage Department. In mid-October, Flint reconnected to the Detroit water supply. This year, Snyder declared a state of emergency in Flint Jan. 5. Besides lead, residents have been exposed to chemical byproducts, E. coli and Legionnaires’ disease in the water. “Often, its people have faced the temptation to lose hope, to surrender to despair. The water crisis again presents that temptation, but again the answer must be to find strength in the love of God and the support of men and women of good will,” he said in a statement. About 40 percent of Flint’s residents live in poverty; the average household income is $25,000.